Babblings of a Mommy: Easter Day Is Here! Hey Everyone!! Just popping in to wish everyone a Happy Easter!! I hope you have a wonderful day with your friends and family. I'm looking forward to having a relaxing day with my family as well. Our Easter tradition is to always to take my daughter egg hunting, but this year she's gone twice already--so we'll have to see what else the Easter Bunny has in store for her. 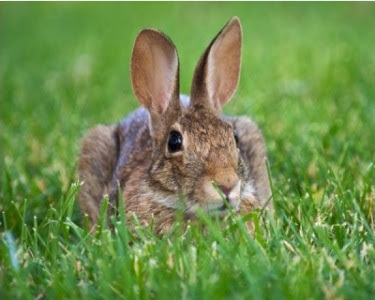 Speaking of Easter Bunnies--there was a cute little brown bunny chillin' in my mother's front lawn yesterday afternoon. My daughter swore it was the Easter Bunny making sure she got her Easter eggs and I couldn't have agreed with her more. She's so cute! I hope you had a wonderful Easter with your family. Jenny she is such a cutie and you dress her up so nice. I love the black and white dress with the pink bow..GORGEOUS! !